I know I recently said slippers are one of the lamest Christmas presents, but these Muji ones are the closest I've found to my favourite pair by Gap (which have long seen better days!). They're a bit plainer than the Gap version, which had a chunkier cable-knit and contrasting trim, but they've got the all-important suede sole and I'm quite liking the simple, utilitarian look. It opens up the opportunities for another weekend 'make it your own' project, and this one's dead easy. 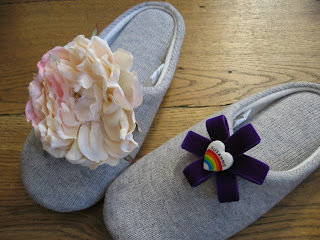 Take one pair of Muji slippers, £9.95, and embellish them however you like. I've just quickly had a hunt around the house and found a flower corsage, some velvet ribbon and a heart brooch that Em bought for me from a vintage shop in Canada. Sew or pin into place and there you have it - from plain to pretty in seconds. Obviously, for a matching pair you'll need two corsages/ribbons/brooches/whatever but there's plenty on the high street to inspire. 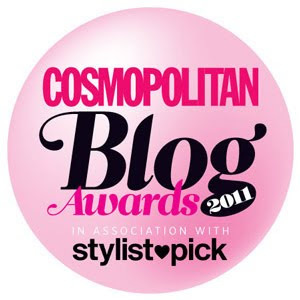 Have a look in H&M or Topshop for some jewelled brooches perhaps, or try a couple of vintage buttons. As for the subject of my ultimate slippers, which I found about five years ago, Gap hasn't seen fit to produce them ever again. I've been vainly searching year after year in the hopes that they'll resurface, so Gap, if you're reading this, please have a rethink. I can supply pictures of mine to jog your memories!